Lac Purple Mirror offered to come in excellent finishing and attractive looks. We offer a variety of Ladies Purse Mirror in various designs & sizes. We are leading manufacture all kind of handicrafts Item . The item made by mud with glass work & nice finish on it. We are an eminent name in this domain, involved in offering a wide range of Hand Held Mirror (Baby Handle Mirror) to our clients. 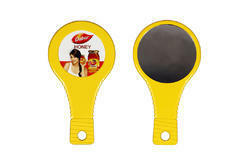 This Hand Held Mirror is made with fine quality of material and widely accepted different regions. Clients can avail this product at market leading prices. The round shaped White Moti Wala Hand Mirror decorated with mounted semi-precious like amethyst, Garnet. The small stones are ruby, emerald and sapphire. Note: Though the shape & design remains the same, the embroidery and the leathercut-work motif may slightly vary from what is shown here. 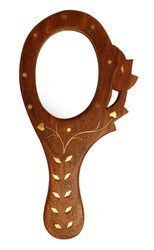 - Kashmiri Papier Mache Hand mirror. 100 per cent handmade. This Oval Shaped Ornate Hand Mirror in Oxidized Metal is sure to attract buyers looking to make their house interior a more stylish place by including the most aesthetically pleasing of items for everyday use. Lovely floral designs have been carved around the mirror and are decked with a glass bead at the centre. It is easy to carry and light to hold. Our Pocket Mirror is available in extensive range of designs with customers having the option to choose from a wide variety in shape, size and color. These mirrors can easily be carried in the purse and pockets of an individual.